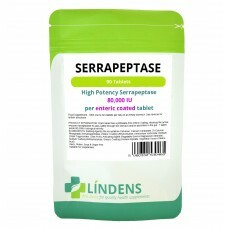 When you buy serrapeptase tablets, they are now dispensed in our new "foil-fresh" packaging. This is heat sealed for safety; once opened however the pack is re-sealable to maintain freshness. The foil pack is comprehensively labelled giving instructions for use and a full list of ingredients to meet current UK legislation. Your purchase is sent direct from our dispensary and is posted in a padded envelope that is letterbox-friendly. Take one or two tablets per day on an empty stomach. INGREDIENTS: Microcrystalline cellulose, calcium carbonate, di-calcium phosphate, serratiopeptidase 50mg providing 80,000iu of activity, enteric coating (ethylcellulose, ammonium hydroxide, medium chain trigylcerides, oleic acid), lactose monohydrate, magnesium stearate, sodium carboxymethylcellulose, sodium alginate,stearic acid. Suitable for vegetarians. The product is free from artificial colours, flavours and preservatives. You are obviously concerned about your own health so ensure you only buy the highest quality natural health products.